Dezeray Lyn just returned from Palestine where she was working as an international observer, activist, and author. She defended Palestinian families’ homes scheduled to be demolished, assisted with the olive harvest, documented human rights abuses, and witnessed the atrocities and the ongoing Israeli occupation. 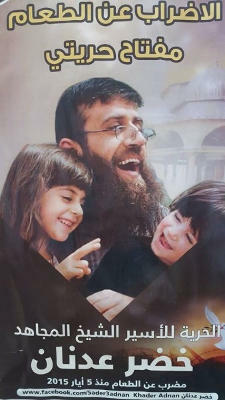 Khader Adnan, a baker with a degree in Mathematical economics currently working towards his master degree in Israeli studies in Al Quds University, father and a former captive of Israeli occupation prisons has brought himself to the brink of death by starvation twice in protestation of the illegal system of jailing of occupied Palestinians termed Administrative Detention. During this trip, Dezeray sat down and spoke with Adnan, one of Palestine’s heroes. Her piece clearly defines what ongoing resistance IS. Read the entire article: “Portrait with Fire: Khader Adnan”. Next Next post: Who Cooked Adam Smith’s Dinner?